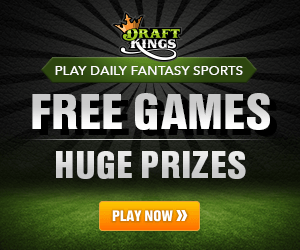 Who hasn’t seen the Draft Kings or Fan Duel Commercials for Weekly/daily fantasy teams on TV? You cant watch a show or sporting event without seeing one. Hell, there is one on this page. During the week of 9/15/2015 Draft Kings ranked number 1 in advertising costs Spending $16.3 million with 5,363 national airings. Fan Duel was right behind them at number 7 Spending $10 million and 2,599 national airings. I even saw news stories about winners on Good Morning America and The Today Show. Guys winning millions and quitting their day jobs. I am sure you know by now how it works. You draft a new team each weak for a fee ($3 for the 100,000 dollar top prize game, $20 for the 1.3 million dollar top prize game) and you must stay within a $50,000 salary cap for your team. Each player is given a dollar amount that is weighted by their skill level. It takes a lot of maneuvering to get your ideal team under the cap. The popularity is rising for good reason, your not stuck with the same team each week. The popularity of these games brings both good and bad attention to the new and upcoming businesses. Politicians across the country, State and Federal, are questioning what the difference is between this and sports gambling on mansionbet.com official website. Residents of Arizona, Iowa, Louisiana, Montana, or Washington cannot participate in DraftKings or FanDuel contests due to state-specific regulations against cash prize awards. “I am writing to request that the Energy and Commerce Committee hold a hearing examining the relationship between professional sports and fantasy sports to review the legal status of fantasy sports and sports betting,” Ranking Member Frank Pallone (D-N.J.) said in a letter to committee Chair Fred Upton (R-Mich.) and Commerce, Manufacturing, and Trade Subcommittee Chair Michael C. Burgess (R-Texas). “Team involvement in daily fantasy sports also raises questions of whether players or league personnel, who may be able to affect the outcome of a game, should be allowed to participate in daily fantasy sports,” he said. So as the scrutiny from the government begins to heat up, the sites remain open to take your money. The appeal seems enticing to those that enjoy fantasy football. I even found myself getting caught up into it and played for the first time last week. Unknowingly I entered myself into the $20 pool thinking I was entering the cheaper pool. A friend also placed high in his Draft Kings pool and won $20 but in reality he won a free ticket to the $20 pool. In the end, the game is worth playing for the fantasy football addicts like myself. I paid $25, played in the 1.2 million dollar pool, received a free ticket for the 100,000 pool that I’m playing this week and have $5 left to play one more week. And if I do well I can gain more vouchers to keep playing until I win Big. And just to help you along (and help us out by using our link or promo code of CORNERPUBSPORTS) I will share with you my value picks (low value with good matchups) for Draft Kings below. The strategy I employ is to get 2 or 3 high value sure things and then load up on value picks. You are also expected to pick 1 Flex.